First, although I ventured into "Harms Way" periodically, ("it was my job"), I always considered; Medics/Corpsman, Rescue Helo Pilots and Crewmen, Special Forces/Seals, and Forward Air Controllers on a higher rung of the "Ladder of Risk" than I ever was. Again, thank you for your service to our country. Secondly, the research of the on-line documentation, (including the post war testimony of the North Vietnamese), that we did to prepare our presentation at last Novembers Reunion, persuaded some of us that the Battle of Lang Vei was arguably as pivotal as say, the Battle of the Bulge in WWII. Therefore, we are kind of proud we were able to do what we were trained for in support of your efforts. Sadly, I do not have any photos of the Lang Vei area on the battle day. Nor do I think any of my squadron mates had any time to snap any pics either. The type of runs we made under the overcast were too much of a handful to permit me the use of a camera. Due to the number of assets that were there when I arrived, I was directed to make a single pass, and salvo my two Mk 117's and six Mk71's "on the bunker". I did however, notice two of the tanks that were destroyed and numerous bodies on the ground. I could not tell whether those bodies were friendly, enemy, or alive during my one pass. I have attached a pic, "NL405onCVA43". I believe it was taken to recognize the young man, Ltjg. Ted Hill, as the pilot of the last A-1 Skyraider attack mission in the U.S. Navy. After his mission on February 20, 1968, all other Close Air Support and Rescue Combat Air Patrol missions were flown by the USAF Sandy Skyraiders. A few days later, the Coral Sea and its Air Wing departed for home via The Sea of Japan to "show the flag" during the USS Pueblo incident. In the picture I have been able to identify the fourteen squadron pilots who flew in the six missions in support of the battle. I've italicised the numbers of their flight, the position in that flight and a time. (ie. "(1-2-0100)", indicates the first flight - wing position - approximate time each flight came under the FAC's control). The listing below, identifies each pilot that flew in our six support missions. 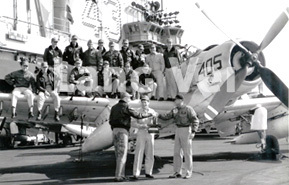 The picture is from the USS Coral Sea, CVA-43, taken circa February 21, 1968. The occasion was a presentation to Ltjg. Ted Hill, for piloting the final combat mission of VA-25, in the last U.S Navy, A-1H/J Skyraider, Canasta 405, Bureau (Serial) Number 135300. The pic includes all the VA-25 squadron pilots and the other officers in the squadron. Presenting the award to Ltjg. Ted Hill, (6-4,1500), (standing center), are (standing left), Cdr. Cliff Church, CO VA-25, (3-1-0945) and (standing right), Capt Bill Shawcross CO, USS Coral Sea, CVA-43. Sitting on the wing are(l to r) Lcdr. Carter Moser, Lcdr. Ralph Smith, (5-1-1330), Lt. Al Nichols, (5-2-1330), Ltjg. Bob Hagen, (3-2-0945), Ltjg. Bruce Marcus, (4-2-1215), and Lt McGee. Standing in same order, CDR Stu Skelton, XO, (6-1-1500), Lt. Zip Rausa, (1-1-0730), Ltjg. Dale Pellot, (2-2-0930), Lcdr Speed Ritzmann, (4-1-1215), Ltjg. Larry Gardiner, (1-2-0730), Ltjg. Chuck Thom, (2-1-0930), Lcdr. Ron Bolt, (6-3-1500), Lcdr. Jack McDermott, and Ltjg Jay Stone. Missing from the photo is Lt. Jack Jordan, (6-2-1500). Toby, It would appear from your e-mail that Bruce Marcus and I checked in with the FAC about 1215, which would be after you departed at 1100. It's doubtful we shared air space with you then. My log book indicates I flew Canasta 405 in the pic above on that mission. "Why am I telling you this? The Squadron call-sign is "Canasta". Toby Rushforth in his FAC Perspective of the Battle of Lang Vei, referred to our A-1's as the "Canasta Flights". I am one of twelve of our pilots that flew sorties from the USS Coral Sea to the Lang Vei Special Forces Camp on February 7, 1968. You probably do not know how pleased all of us in the squadron were, when the news came back to the ship that, "The survivors that were trapped in the bunker, had managed to vacate the bunker and run down the road to Khe Sanh". I wish to take this opportunity to thank you, and the other members of your detachment for your service to our country.......God Speed." © Copyrights 2016 langvei.com, All rights reserved.